Lilacs are blooming like gangbusters now. They’re early, like everything else is this spring, but that’s OK.
I’ll probably post a lot about lilacs because I can’t get enough of them. I’m sure onlookers must have rolled their eyes at the site of a middle-aged man in Carhartts stopping at every damn lilac bush, but the hell with them. Last night, when I got home, it was warm and breezy, a beautiful spring night. My lilacs are just starting to bloom and give off their scent, as you can see by the picture I shot this morning of a rain-kissed lilac near my front door. 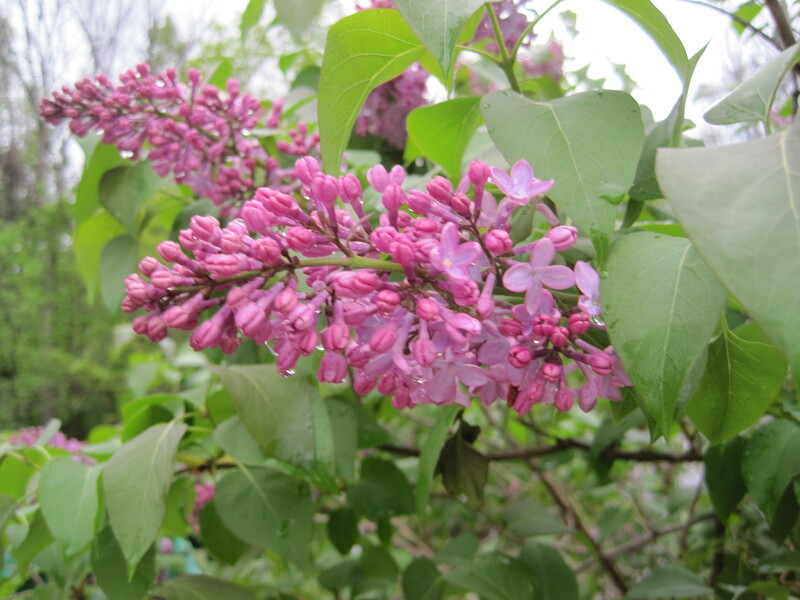 I stood downwind from one of my lilac bushes as I talked with my friend Craig on the phone. So that was a great moment: Catching up with a friend I hadn’t talked to in awhile, and breathing the sweet smell of lilacs. Makes for a nice end to the day, doesn’t it? This entry was posted on May 6, 2010 at 11:41 am and is filed under Uncategorized. You can follow any responses to this entry through the RSS 2.0 feed. You can leave a response, or trackback from your own site. I’ve been amazed that the lilacs are blooming so early this year. Was in the ONE yesterday and did the same thing you did…stopped and smelled the lilacs! I have a vase full of lilacs on my kitchen table, given to me by friends for my birthday yesterday. Spring Bliss!